-Beds.Cozy, comfy beds, pillows and sheets.Loved their turn down service as well with the towel animals,next day schedule and 2 chocolates. -Balcony cabins.If you cruise, a balcony cabin is a big plus.Nice to have your own private balcony with views of the ports and the ocean. There were many a night I would wake up and go out onto the balcony just to hear the ocean lapping against the boat,see the white caps out on the dark ocean and smell the fresh air. -There is a wide variety of foods for everyone, to satisfy everyone's taste buds.Even a 24 hour spot to grab something to eat. -Sailing into the ports of call was interesting.It was interesting to see different cultures as well. It makes you much more appreciative of your own home. -Loved the availabilty of the salon on the ship.Gerry had a manicure and I had my hair done for the wedding. -Internet service. I took my lap top and wanted to keep touch with the family back home and with you all, but it costed me a small fortune. Rates ranged from .33-.75 a minute, depending on the package you needed.The connection was very slow as well, so by the time you did connect and get to where you wanted to be, you had already used 5 minutes of your time. -Noise.Absolutely unreal Carnival. I know your known as the Fun Ship but we honestly need a vacation from this vacation.There were doors constantly being slammed, kids running in the halls all night and yelling and playing in the elevators,( parents, where were you?? ).The piano bar was in a location that could be heard almost everywhere- especially where we were located. We will not recommend you to our friends. -Alcoholic beverages.The cost of the few drinks that Gerry had were in the $7.50-$9.50 each range!Wow! The drinks are being pushed from 9 or 10 am from what we saw and some people drink alot,so I'm not sure what their final cruise bills were but I'm sure it could get crazy, as you only charge to your room card, and without actual cash in hand, wow, is all we were thinking. -Room Amenities.No in cabin coffee,no clocks to know what time it might be in the middle of the night,an ice bucket in the room but where are the ice machines?? -Entertainment. Not very good and some things like your bingo, we had to pay. With all the money you were making off our drinks and from the casino, could you not have allowed us a bingo game win "on the house"? -Gerry watched your baggage handlers in the terminal throwing around luggage like they were playing ball.He said he was glad my lap top wasn't in any of the bags.There was no consideration for our luggage or anyone else's for that matter. 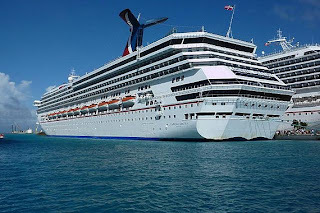 We were glad in one way to have experienced a cruise but if we could have done it again, it would have been with another cruise line or it would have been a fly in to Miami and a drive to the Keys.